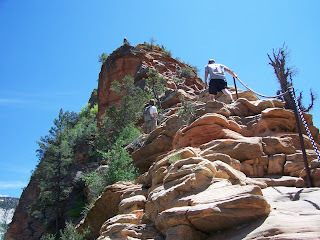 And a Something Something Else: Zions! Over Mother's Day weekend, Michael and I got to go camping in one of our favorite places of all time: Zion's National Park, UT. We took some friends with us, who happened to be celebrating their 8 year anniversary, and we had SO much fun. We drove down and stayed at Mike's parents' condo on Friday night (they totally rock for letting us stay with them on their own 30 year anniversary trip), and then Saturday we drove into the park. 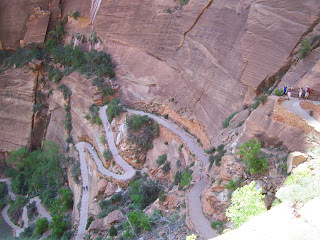 Our first job after acquiring camping was to hike the amazing Angel's Landing hike (about 5 miles round-trip). Here's a view of part of the hike, it's mostly long stretches of switch-backs (until you get towards the top, then it's short stretches of steep switch-backs), and boy did our feet start aching! In this picture you can see our friends Shelly and her hubby Jason on the right-hand corner, Shelly has her arms raised. 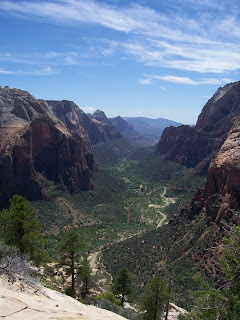 This picture is the view of the last 1/2 mile of the hike out to the edge of Angel's Landing. It's the scariest part as you have to climb up the rock using chains and you can see down the almost 1,500 ft. you've just hiked. I was terrified the first time Michael made me go on this, but this time I was feeling gutsy and enjoyed the view beyond while I tried not to look down. This view is the great reward for all the hard work it takes to get to the top. It is so beautiful there, you just can't believe it! You can see most of the park from the top, this picture is just the right/South side view, there's more on the left/North (but my pictures weren't as pretty). There were TONS of people on the hike, more than we've ever seen before, so the top was a bit crowded by our standards (last time we hiked it we were the only ones up there), but we were glad to see the park getting so many visitors - and it was fun to hear the wide variety of languages as people come from all over the world to see the park. My feet hurt for the rest of the trip, but it was totally worth it. 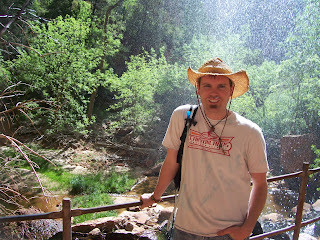 Here's Michael at the lower Emerald Springs pool, the hike we took on Mother's Day. It is a beautiful hike also with three levels of pools and waterfalls that feed them. 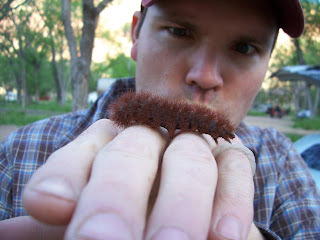 It was so green there with it still being "Spring", it was so much fun! 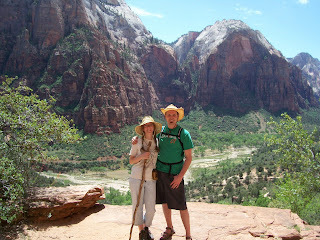 Wow Risa & Mike I have never seen Zions in the Spring. It is beautiful! What a fun Trip.